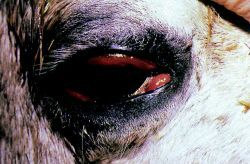 an acute, often fatal, virus disease of horses and mules transmitted by mosquitoes and characterized by central nervous system disturbances; in the U.S., this disease is typically caused by one of three alphaviruses, and their resulting diseases are designated western equine, eastern equine, and Venezuelan equine encephalomyelitis; these viruses belong to the family Togaviridae and can also cause neurologic disease in humans. an arbovirus infection with a member of the Togaviridae family, Alphavirus, characterized by inflammation of the nerve tissues of the brain and spinal cord. Other characteristics include high fever, headache, nausea, vomiting, myalgia, and neurological symptoms, such as visual disturbances, tremor, lethargy, and disorientation. The virus is transmitted by the bite of an infected mosquito. Horses are the primary host of the viruses that cause the infection; humans are secondary hosts. Because horses are deadend hosts, they are not a significant risk factor for human infection. Eastern equine encephalitis (EEE) is a severe form of the infection, with a mortality rate of 33%. The main EEE transmission cycle is between mosquitoes and birds, specifically the mosquito Culiseta melanura. EEE occurs primarily along the eastern seaboard of the United States and lasts longer and causes more deaths and residual morbidity than western equine encephalitis (WEE), which occurs throughout the United States and produces a mild, brief illness, as does Venezuelan equine encephalitis (VEE), which is common in Central and South America, Florida, and Texas. There is no specific treatment for EEE; care of patients is supportive. See also encephalitis, encephalomyelitis. 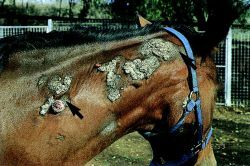 One of a range of diseases of horses and humans, featuring inflammation of the brain, and caused by various strains of ARBOVIRUSES, occurring in the Americas as several types, especially Eastern, Western, Californian and Venezuelan. Epidemics of encephalitis are often preceded by death of horses. Most cases are acquired by mosquito bites. There is no specific treatment and cases often end fatally or with severe permanent brain damage. Eastern equine encephalitis virus disease, although rare, remained the most severe domestic arboviral disease, with two deaths among eight patients. Coverage of the Equine Encephalitis pipeline on the basis of route of administration and molecule type. The most lethal pediatric neuroinvasive arboviral disease is eastern equine encephalitis virus infection, with a 38% mortality rate. Epidemiology of eastern equine encephalitis in Massachusetts. So far, the Food and Drug Administration has not approved an equine encephalitis inoculation, the Joint Program Executive Office for Chemical and Biological Defense web site said. A recent article on Eastern equine encephalitis virus stated: "Given that EEEV, like malaria and dengue, is caused by a virus, there is no specific treatment . Four cases of Eastern Equine Encephalitis were confirmed in Massachusetts as of late September, and two, including one in a 5-year-old child--have been fatal, according to the Massachusetts Department of Public Health. This invading non-indigenous species should be monitored closely since it is a known vector for several viral pathogens including those responsible for West Nile fever, Saint Louis encephalitis, Japanese encephalitis and eastern equine encephalitis. In other cases, lysergic acid (LSD) was given to individuals without their consent, and biological weapons, such as infectious agents that resulted in Venezuelan equine encephalitis and tularemia, were sprayed over parts of St.